Production is critical to hospital and nursing home laundries, as is washer programmability. Production is critical to hospital and nursing home laundries, as is washer programmability. These facilities clean a variety of items, including sheets, towels, blankets, gowns, bed pads and personals – all of which must be properly cleaned with the appropriate mix of chemicals, mechanical action, number or rinses, extract speed, water temperature and more…Thanks to intuitive microprocessor systems, Continental washers deliver wash cycles so flexible that even advanced applications like ozone injection can be programmed with just a few touches. Automatic chemical injection and one–touch operation ensure ease of use and a consistent and safe clean! Advantage Equipment offers commercial washers delivering superior productivity. Our most productive model is the Continental E–Series. E–Series Washers generate extract speeds up to 387 G–force—double the extract of most traditional, hard–mount commercial washers. In turn, dry time is reduced by up to 50 percent! High–extract significantly boosts laundry productivity and cuts gas consumption! Because it takes less time to complete the laundry, healthcare operations cut labor hours and overtime. 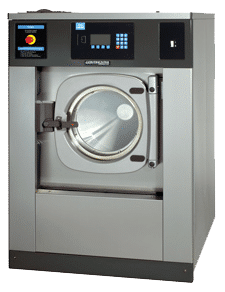 Highly programmable, Continental Girbau’s commercial washer–extractors offer hotels and resorts the ability to perfectly wash nearly any item type. Users simply enter a program number, load the washer and press start. Automatic chemical injection is an essential for hospitals and nursing homes concerned about proper removal of body fluids and other contaminants. Auto injection eliminates the need for adding chemicals manually and chemical overuse and waste. It ensures items are properly cleaned every time! Typically, automatic chemical injection can result in a significant savings in detergent costs. Continental E–Series soft–mount washers can be installed nearly anywhere without concrete foundations or bolts. This is critical for some healthcare facilities lacking proper foundations or space. Continental Dryers are not only highly programmable and simple to operate, they offer Linen Life Extension (LLE). LLE is a moisture sensing system that ensures laundry is not over dried and damaged. 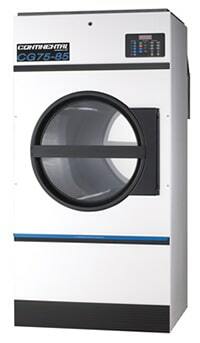 It automatically detects the moisture level of a load and shuts down the dryer when the preset dryness level is reached. An optional Integrated Sprinkler System (ISS) is also available on single-pocket models. ISS quickly squelches dryer fires before they get out of control. or get information on other products or services.